A dental implant is a small titanium screw that serves as the replacement for the root portion of a missing natural tooth. Dental implants can be placed in either the upper or lower jaws. Due to the bio-compatible properties of titanium, a dental implant fuses with the bone and becomes a good anchor for the replacement tooth. Dental implants can be used in solutions for replacing single or multiple missing teeth. 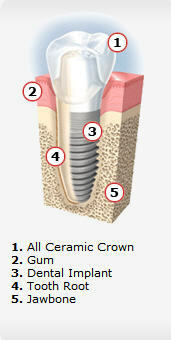 Looking for dental implants in the Las Vegas area? Contact Steven Rhodes, DDS today to schedule an appointment at our local prosthodontics office!